A university engineering professor said tunnelling expertise and changes to vehicle technology can help make the proposed Cambridge Metro a reality. Prof John Miles said the city's narrow streets would make a conventional tram system impossible - so a radical solution was needed to cut congestion. He said Britain was a world leader in "boring small tunnels". But transport campaigners want improvements now on more conventional solutions such as smart traffic lights. 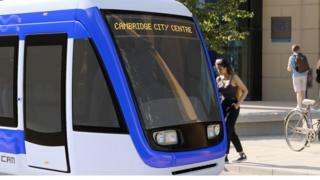 On Monday, a feasibility study suggested work could start in 2021 on the Cambridgeshire Autonomous Metro (CAM), using trackless electric vehicles to link the city to outlying areas. Part of the network would be underground. The CAM has been proposed by the Cambridgeshire & Peterborough Combined Authority and its mayor and it would provide new links from the city to St Neots, Huntingdon, St Ives, Haverhill and Mildenhall. Prof Miles, from the University of Cambridge's engineering department, told the BBC's Sunday Politics East programme that advances in vehicle technology made the CAM affordable. "We have autonomous and electric vehicles so we can propose a trackless tram - we don't have to have rails in the ground or any overhead power cables," he said. "It can all be run by batteries, just like electric buses and that makes a huge difference to the cost of these vehicles." The CAM could take 10 years to develop and transport campaigners want congestion solutions more quickly. "We need to utilise the existing infrastructure instead of laying more tarmac," said Chris Rand of Smarter Cambridge Transport. "There are things the mayor could do, like looking in bus franchising, which are not as glamorous, but which would really make a difference." Mr Rand said smart technology controlling traffic signals and bus information would also have an immediate impact. Watch a report on Sunday Politics East on BBC One at 11:00 GMT on Sunday, 24 March and then available on the BBC iPlayer. At least 137 people are reported killed and hundreds more hurt in six blasts in several cities.